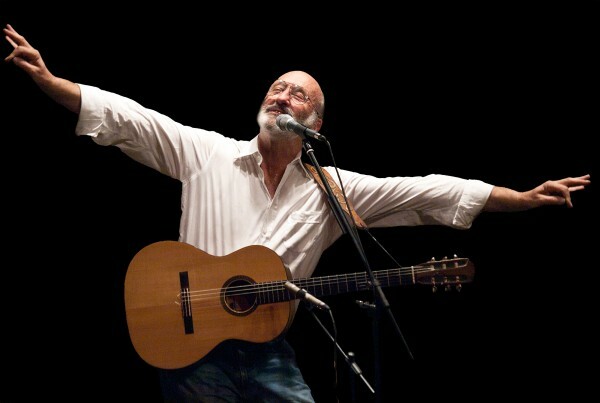 For his latest studio album, “One and Many,” out this past August, Noel Paul Stookey had a lot of people working with him. The Bangor Symphony Orchestra, for starters, which recorded three songs with Stookey, one-third of iconic folk trio Peter, Paul and Mary and a longtime Blue Hill resident. There’s the many characters that inhabit the 15 songs on the album, from the unsavory types on “The Connection” to the lovers on “Cue the Moon.” And there’s ongoing spiritual presence of Mary Travers, who passed away three years ago at the age of 72. Stookey, now 75, spoke with the Bangor Daily News about working with a symphony orchestra, the continuing relevance of folk songs, and his many friends in music, in the 50th anniversary year of Peter, Paul and Mary’s first album. “One and Many” is available on iTunes and Amazon, and the EP he released with the Bangor Symphony Orchestra, “The Cabin Fever Waltz EP,” is available at Blue Heron in Bangor, Metropolitan Soul in Bangor and Orono, Bangor Wine and Cheese Company, the Penobscot Theatre, the Maine Discovery Museum, or by contacting the Bangor Symphony. Tell us about the BSO collaboration. How did it come about? Had you worked with an orchestra before? Well, because of the Peter, Paul and Mary appearances we’d done at the Collins Center over the years, we’ve always had a local connection. David came to me – he’s very gregarious – and we started talking about a collaboration. Then Lucas came along, and he’s quite a sparkplug, so he really made this come about. Kingsfield Pops was the impetus for it, and they work with local artists every year. I wrote a song for it, and it happened to be a very whimsical, easily translatable piece for an orchestra … Recording with an orchestra can be prohibitively expensive, so we made a deal. I’d give the BSO exclusive use of one of my songs [“The Cabin Fever Waltz”], and I’d get to use the BSO for one of the songs on my new album [“Cue the Moon”], and we’d share one song [“America The Beautiful”]. I’m really pleased with how well it all worked out, and David really used the sponsor money very efficiently to create that lovely special edition CD. Your new album, “One and Many,” is your first in five years. Tell us about the songs included on this release, and what message you wish to convey as a whole. As I have written and matured as a songwriter, I’ve begun to recognize the importance of love with a capital “L.” Everyone has a sense of love with a small “l,” but quite often our personal agendas get in the way of thinking about the big “L.” We have to step beyond our personal shell and into the realm of community. I think folk music has always done that, because it had something to say, and it wasn’t about making a buck. Ever since folk music broke the mold in the 1960s about what music could talk about, it’s not only been entertaining but instructional. And so I think this album addresses a lot of things from a lot of perspectives, and is in reaction to what I see. There’s a song about El Salvador, a song about reconstructing Haiti, a song about the drug trade, and even a romantic ballad. And then, with “America the Beautiful,” I wanted to update the lyrics to address things like the immigrant experience, the native experience, and ecological concerns. It’s one of our prettier patriotic anthems, and it was something I really wanted to include. This is your first album after Mary Travers’ passing in 2009. How does that affect you? Peter and I still perform about a half dozen shows over a period of a year, and they’re quite nostalgic. Her presence is still felt. Anyone that has lost a loved one knows that it can really make you commit to carrying on the dream, whatever it might have been. We as survivors won’t let that die, and we’ll carry on making our statement, not for the dollar but for the heart. That’s a really nice thing to have inherited from her. Out of all your contemporaries from the 1960s folk scene, who do you still keep in touch with? Who do you still listen to? What do you listen to for contemporary music? Oh, definitely Tom Paxton. Judy Collins. Ramblin’ Jack Elliott, when I get the chance. My musical tastes have always been a bit skewed. I was never quite the folkie, though I always traveled in that world. My tastes have always run towards Dave Brubeck, or Bach. I’ve always loved classical music. I always played the color chords in our arrangements. I still listen to a lot of baroque music. But then again, I also really enjoy a lot of hip hop. I founded a public domain music foundation in the 1970s, which has morphed into Music2Life, which is a support group for contemporary music of social change, and we’ve got some wonderful hip hop artists. I think Woody Guthrie’s talking blues is not very far off from hip hop. People just use different vernacular to reach for the same piece of unity.